So you’re thinking of using a stone to sharpen your knives, and are probably wondering what your choices are. Looking at it from a high level, sharpening stones can be broken down into three different types: oil stones, water stones, and diamond stones. Oil and water stones are available as natural or artificial i.e. man made, whereas diamond sharpening stones are always artificial. If you wanted to get even more detailed, you’d look at what material each stone is composed of and the different grits they are available in. Oil stones as the name suggests are lubricated by oil, as water stones are lubricated by water. Diamond stones don’t need to be lubricated, but you can use water if you really wanted to. Which of the three types is the best? That’s a loaded question and the answer is it really depends on what you need it for and how you intend to use it. Some enthusiasts prefer natural stones, while others prefer artificial, and the same preference holds for oil vs water vs diamond. The video below (all credit to Sharpening Supplies) does a great job at explaining all of this. Did you watch the video, and if so what did you think? It’s important to understand the basics of sharpening stones before you decide which type to get. Each type has it’s own advantages and disadvantages, and it will be up to you to decide what works best for your needs. Having said that, the discussion of this post will be limited to diamond stones. They Are The Hardest: Yes, diamond stones are the hardest from the lot. And that’s because diamond is a much harder material compared to aluminum oxide, and silicon carbide (examples of abrasives found in other stone types). What does this mean as far as sharpening is concerned? It means metal from your blade/tool is removed or stripped off much easier and faster. They Are The Flattest: Because of how hard diamond is, it hardly ever wears or disintegrates, so a diamond stone even after several uses will remain flat. You may not care too much about flatness right now, but I’ll tell you it’s incredibly important! Sharpening on a flat stone versus one that is not completely flat can give you 2 entirely different results. Because of this special property, diamond stones are actually used to flatten other less harder stones. This process is referred to as truing. They Don’t Need To Be Lubricated – As mentioned previously, you don’t need to lubricate diamond sharpening stones with water/oil. Some people like to, but I find that it’s not necessary. Continuous Surface – This is basically a sheet of steel impregnated with diamond particles. To the naked eye, it looks like any other normal steel surface, but that’s not the case. Beware however, you can buy cheap versions of this stone that have hardly any diamond. Pitted Surface – Also known as interrupted surface, this stone features little pits or holes. The purpose of the pits are to help collect any steel residue as a result of sharpening. I personally prefer the continuous/non-pitted stones. I find they are incredibly easy to maintain and they last forever! All These Choices! What Should I Get!? There are quite a few choices when it comes to diamond stones and sharpeners, so it can be difficult to decide what to get. 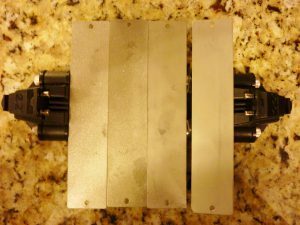 One thing to keep in mind is diamond sharpening stones usually tend to be more expensive than all the other stones, so be prepared to spend a little more than usual. Avoid knockoffs and counterfeits at all costs! They may be cheaper, but the quality is well below par. Below are some of my favorite recommendations! 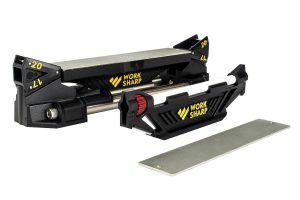 Pivot Response – The pivot response makes sharpening so much easier for curved blades, by easily allowing you to track and follow the curvature of your edge. Diamond Plates – The stones aren’t just high quality, they’re pretty small as well. This makes the system perfectly handy for outdoor camping or hunting trips. If you decide on buying, just make sure you also get the upgrade kit! It includes extra coarse (220 grit) and extra fine (800 grit) diamond stones, as well as a stropping plate. Finally, If you wish to see my complete review on this product, click here. It would be injustice to not mention DMT as a recommendation for diamond stones. They boast 4 decades worth of experience, focused on making the best diamond sharpeners. They have plenty of products to choose from but one of my favorites is the set of 3, 6 inch stones. Unlike the diamond sharpening stones of the GSS above, these are pitted with polka dots on the surface. What I like about this particular set of stones is how simple and versatile they are. The storage box is convenient, making it easy to carry when on the go. But best of all is the quality of these stones. If used correctly, you can expect some incredible results! 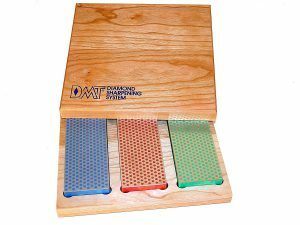 Using diamond sharpening stones are no different than using any other stone. Having said that, everyone has his/her own technique, so don’t be surprised to see variations! Below is a quick step by step on how I use mine. I hope it helps! 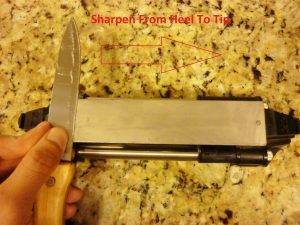 Identify Your Sharpening Angle – The first and all important step is finding out which angle you’ll be sharpening your edge to. Sometimes it’s easy to find out, and other times not so much. 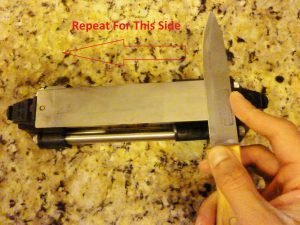 If it’s an expensive knife like a Wusthof, you should be able to find this out pretty easily on the internet, or from the manufacturer. If it’s a cheap $10 knife, this may be more of a challenge. At this point, all you can do is make an assumption. Is it an Asian (super thin 15 degrees) or Western (20-22 degrees) style? Or is it a thick hunting style (25-30 degrees)? Pick Your Grit – Depending on the condition of your blade, you will need to decide what grit to use. If your edge is dull and needs to be completely re-profiled, pick a coarse stone. However, if your blade only needs a quick touch up and polishing, pick a fine or extra fine stone. Sharpen From Heel To Tip – Start at the heel and cut through the diamond stone eventually making your way to the tip. Don’t rush! Slow and steady wins the race! Repeat #3 But For The Other Side – Repeat the same above but for the other side. Rinse & Repeat – With every pass you make on one side, you should do the same for the other side of the edge. Complete a total of 6-7 passes for each side. 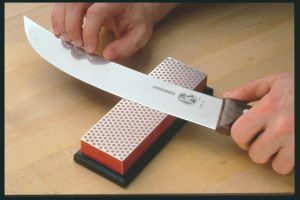 Check For Sharpness – Check how sharp your knife is by attempting to slice through a piece of paper. Is the cut clean, or is it rough? Does it slice at minimum pressure? Answer these questions and determine if you still need to keep sharpening, or if you can stop. That’s all I have to say about diamond sharpening stones. A relatively modern technology that works wonders if used correctly. Many people swear by them, and use nothing else. If you have any comments or questions, please leave them below and I’ll be sure to get back to you. Otherwise, enjoy what’s left of the weekend and have a fantastic week ahead!